Located at the UFP headquarters, was named Fernando Pessoa Library (BFP) in August 2012, following the regrouping of the UFP’s libraries. This library also hosts a Test Library, composed by several psychological evaluation instruments, providing support to both pedagogical and practical components of the degrees on Psychology. 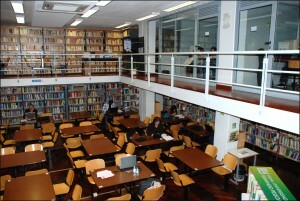 Fernando Pessoa Library has a reading room with seating for 68 people, plus a higher level with 10 seats, a technical office, 2 group study offices and research stations equipped with Internet access, intended exclusively for UFP’s students and employees.